NEW YORK - Circa July, 2016 - An aerial view of lower Manhattan and the Freedom Tower. NEW YORK - Circa July, 2016 - An aerial view above lower Manhattan and the Freedom Tower. NEW YORK - Circa July, 2016 - An aerial view above the Freedom Tower in Lower Manhattan. 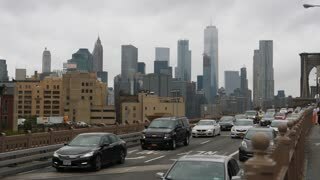 NEW YORK - Circa July, 2016 - A timelapse view of the skyline of lower Manhattan with the new Freedom Tower standing tall. NEW YORK - Circa July, 2016 - A day time lapse shot of the new Freedom Tower in lower Manhattan. 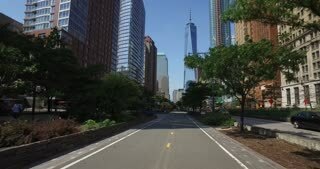 NEW YORK - Circa July, 2016 - View of lower Manhattan and the Freedom Tower as seen from the Hudson River Greenway bike path. 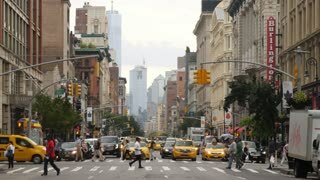 NEW YORK CITY - Circa October, 2017 - A slow motion middle of the street view of pedestrians in a Manhattan 6th Avenue crosswalk with the Freedom Tower in the distance.